This page contains overviews of the alternate geographical developments in Lands of Red and Gold. There are two major groupings of overviews: A list of maps and a list of alternate geographic placenames and terminology. Arranged alphabetically. Don't read it if you haven't read the timeline yet and you're worried about possible spoilers. This is a work in progress, so please be patient. Remember, you can always speed up the process by volunteering in the timeline's main thread. - Add new geographic info from later chapters, if it's still missing. Please follow the manual of style already set up by the following lists. Anedeli - Gunnagalic name for the OTL Darling river. Anerina - Gunnagalic name for the OTL Loddon river. Archer's Nest - OTL Redcliffe (a suburb of Perth in Western Australia), home to a garrison city of the Atjuntja Empire. 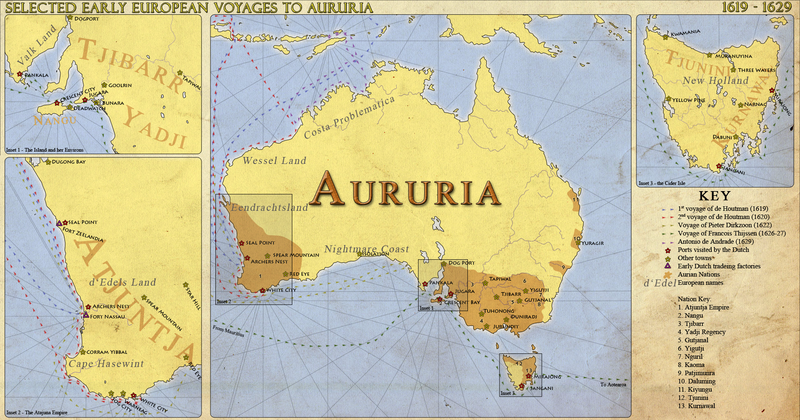 Aururia - Latin for “Goldland”, eventually chosen by Europeans as the name for the Australian continent. Bidgee - The OTL Endeavour River on the Cape York peninsula in northern Queensland. Big Island - one of early native Australian terms for OTL Tasmania, later superseded by “Cider Island”. Bitter Lake - OTL Lake Alexandrina in South Australia, probably the world's largest freshwater/saltwater lake. In Lands of Red and Gold, there are local trading posts on its shores and several important trading routes. Cider Isle or Cider Island - OTL Tasmania, common name for the island in most native Australian languages, referencing the sweet gum cider that is a prominent export foodstuff of the Tasmanian settlers. Coonrura - port town on the site of OTL Kingston SE in South Australia. In the timeline's story, it is a staging point for the 1638 Dutch invasion into the Yadji Empire. Copper Coast - Gunnagalic term for the fertile regions in contemporary south-eastern South Australia, stretching from the Murray Mouth to Port Augusta. It holds most of south Australia’s population and agriculture. The Gunnagal call it the Copper Coast for reasons of historical memory: It was the most important ancient source of copper. While the metal is still mined there, it has become less important since the Gunnagal learned the arts of ironworking. Iron is mined both in the Copper Coast (some small deposits) and in other locations throughout Tjibarr’s territory. Corram Yibbal - OTL Bunbury in Western Australia, home to a garrison city of the Atjuntja Empire. Crescent Day - both a name for the bay and the Nangu city located on its shores, on the location of the OTL town of Kingscote on Kangaroo Island, South Australia. D'Edels Land - Dutch name for Tiayal. Dabuni - Kurnawal city on the site of OTL Hobart in Tasmania. Daluming - Bungudjimay name for the OTL Macleay river. Djawrit - a mining town of the Yadji empire with gold mines, lying within contested borderlands, it exists on the site of OTL Bendigo. Duniradj - a Yadji Empire settlement with a convergence of two of the most important roads in the empire, on the site of OTL Melbourne, the capital of the state of Victoria. Durigal - The colloquial Junditmara name for the Yadji Empire. Literally “The Land of Five Directions”. 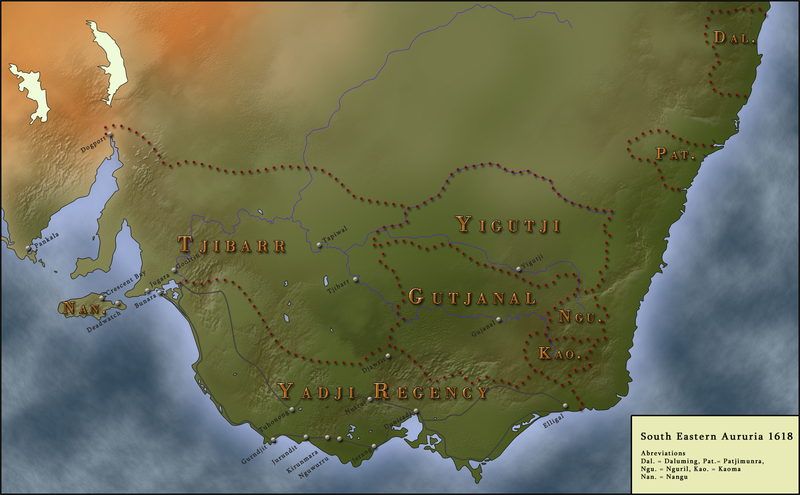 Elligal - the easternmost large city of the Yadji Empire, on the site of OTL Orbost. Fog City - OTL Walpole in Western Austrlia, one of the three initial Atjuntja city states, later subjugated by the ruler of the White City. Fort Nassau - The first Dutch trading station and colonial settlement in Aururia, founded on the coast of the Atjuntja Empire on the site of OTL Fremantle, Western Australia. Gamoma - Kurnawal city on the site of OTL Orford in Tasmania. Garrkimang - OTL Narrandera in New South Wales, a newer Gunnagalic city state that over time evolved into a kingdom and later on into the Watjubaga Empire that united the Gunnagal polities and their neighbours. Goanna River - a name used by local natives for the OTL Swan River in Western Australia; despite the native name, the Dutch have named the river the same as in OTL, after the flocks of the black swans typical for this part of Australia. Gray Sea - Name for the OTL Tasman Sea in the language of the Nangu. Gulibaga - “Dominion of the Three Rivers”, the first ever native empire on the Australian continent, founded by the Kingdom of Garrkimang via conquest and unification of other Gunnagal states, later enlarged into the Watjubaga Empire, its definite form. Gunawan - OTL Snowy River. Gundabidgee - one of the first and oldest cities and city states of the Gunnagal civilization, built after Tjibarr. Gurndjit - coastal city of the pre-Imperial era Junditmara and later of the Yadji Empire, an important port on the site of OTL Portland, Victoria. Gurrnyal - Gunnagalic name for the OTL Lachlan river. Gutjanal - old Gunnagalic city, existing both in the Imperial and post-Imperial era of Gunnagal history, on the site of OTL Albury-Wodonga. Hope Hill - volcanic plug peninsula on the northwestern coast of Tasmania, known in OTL as Circular Head or The Nut. (The) Island - OTL Kangaroo Island, inhabited by the Nangu people. Non-islander native ethnicities refer to it simply by this name. Isle of Bronze - Nangu name for OTL Tasmania, name used by Nangu traders before gum cider became a greater commodity. Isolation - an aptly named outpost settlement founded by the Nangu in a small coastal oasis of the otherwise arid Nullarbor Plain; it lies in the same general location as the OTL town of Eucla, Western Australia, and serves primarily as a Nangu resupply and refuge port. Jangani - OTL Cockle Creek in Tasmania, site of a Kurnawal town/settlement that refused to become a part of a new unified Kingdom of the Kurnawal after the exodus of the Kurnawal to eastern Tasmania. Jurundit - Junditmara town whose rich volcanic soils supported the best farming in their region, on the site of OTL Koroit, Victoria. Kakararra - settlement on the site of OTL Koo Wee Rup. Kantji - a city in the Kingdom of Lopitja, on the site of OTL Menindee. Kirunmara - the capital city of the Yadji Empire, on the site of OTL Terang, Victoria. Kwamania - Tjunini city on the site of OTL Smithton in Tasmania. 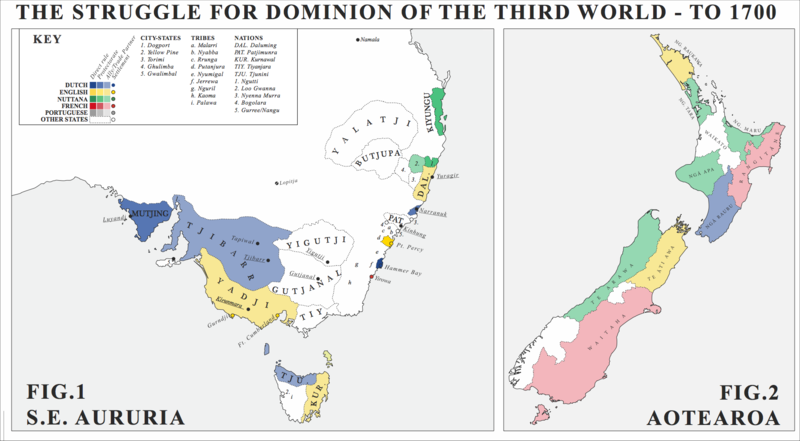 The Land of Five Directions - the translation of the Junditmaran colloquial term “Durigal”, used as a common synonym for the Yadji Empire. Lobster Waters - OTL Jurien Bay in Western Australia, home to a garrison city of the Atjuntja Empire. Lopitja - a small post-Imperial 12th century Gunnagalic kindgom in OTL New South Wales. Gutjanal, Tjibarr and Yigutji are among its rival countries. The eponymous capital Lopitja exists on the site of the OTL town of Wilcannia in New South Wales. The capital's name itself comes from the name of one of the late Watjubaga emperors who founded it. 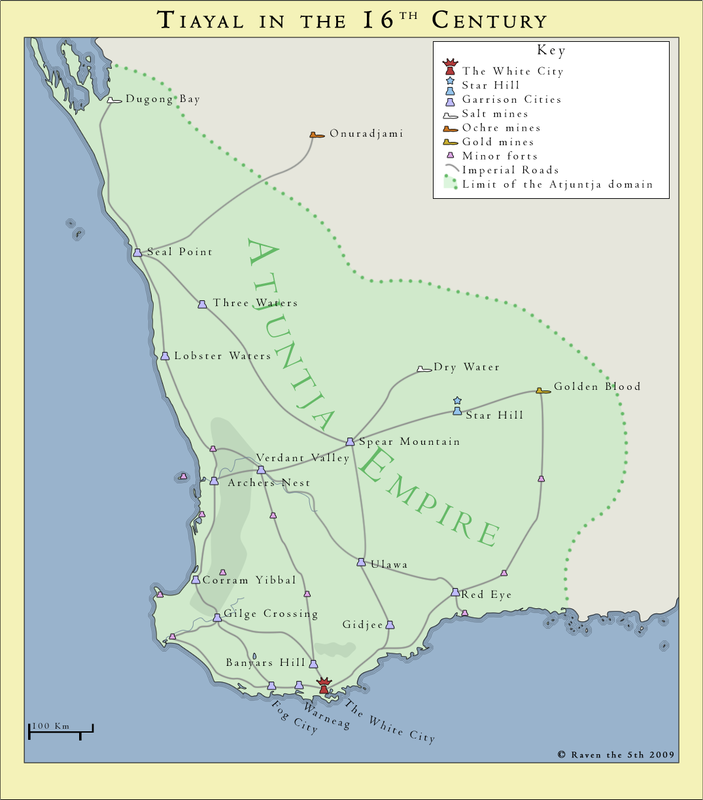 Luyandi - one of the Mutjing city states on the Seven Sisters peninsula (OTL Eyre Peninsula), located on the site of the OTL town of Port Kenny, South Australia. Matjidi - Gunnagalic name for the OTL Murrumbidgee river. Milgawee - OTL Albany in Western Australia, Milgawee is the capital of the Atjuntjan Empire and one of the empire's three main ancestral city states. Its name means “White City” in Atjuntjan. This lead to early Dutch explorers naming it with the calque “Witte Stad”. Mukanuyina - Tjunini city on the site of OTL Devonport in Tasmania. Mulaka Nayri - Tjunini city on the site of OTL Wynyard in Tasmania. Narnac - Kurnawal city on the site of OTL Woodbury in Tasmania. Nguwurru - the largest population centre in the eastern part of Junditmara territory, on the site of OTL Cobden, Victoria. Ngutti - northernmost city in the lands of the Bungudjimay, on the site of OTL Yamba in northeastern New South Wales. Nilkerloo - one of the Mutjing city states on the Seven Sisters peninsula (OTL Eyre Peninsula), located on the site of the OTL town of Elliston, South Australia. Nurrot - a Giratji town with important gold mines in its vicinity, on the site of OTL Ballarat. Nyalananga - Gunnagalic name for the OTL Murray river. Pankala - one of the Mutjing city states on the Seven Sisters peninsula (OTL Eyre Peninsula), located on the site of the OTL town of Port Lincoln, South Australia. Pankala is a major port city of the peninsula and of the Mutjing. Place of Gathering - see Tjibarr. 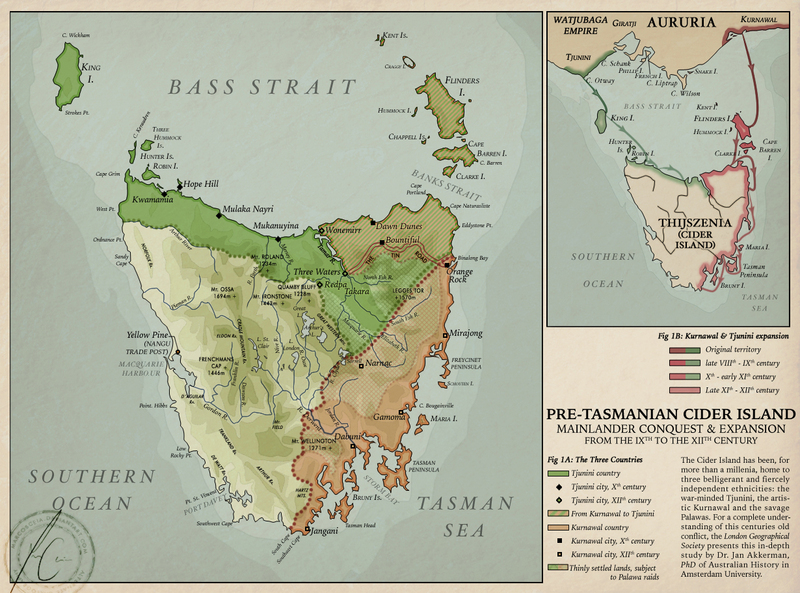 Place of Tin - one of early native Australian terms for OTL Tasmania, later superseded by “Cider Island”. Pulanatji - Gunnagalic name for the OTL Macquarie river. Raduru lands - they lie in and around the OTL Illawarra region, New South Wales. Red Eye - OTL Ravensthorpe in Western Australia, home to a garrison city of the Atjuntja Empire. Red Lands - general colloquial name of Gunnagalic cultures for the outback outside of the lush and wet areas around the great rivers and lakes of Australia/Aururia. The Seven Sisters - a name given to the peninsula that contains the Mutjing lands. In OTL, this is the Eyre Peninsula in South Australia. Seal Point - Atjuntjan settlement on the location of OTL Geraldton in Western Australia. Silver Hill - Gunnagalic term for the mining area and settlements on the site of OTL Broken Hill, New South Wales. South-Land - Name given to Australia by the early Dutch explorers of the continent. Spear Mountain - OTL Merredin in Western Australia, home to a garrison city, dam and reservoir of the Atjuntja Empire. Spice Coast - colloquial native name for the eastern Australian coast. Spine - colloquial native name for the OTL Great Dividing Range. Star Hill - OTL Boorabbin, Yuduwungu settlement renowned for its observatories and long tradition of highly educated astronomer/astrologist scholars (due to the popularity of astrology in this settlement, it is later dubbed “the Delphi of Australia”. Tae Rak - Junditmara name for OTL Lake Condah, the region surrounding it has been continuously occupied by Junditmara peoples for eight thousand years. Tapiwal - OTL Robinvale, an ancient Gunnagal trading hub city (though founded later than the oldest ones) on the south bank of the river Murray in OTL northern Victoria. Tarpai - probably the most prosperous city in the lands of the Bungudjimay, on the site of OTL Port Macquarie in northeastern New South Wales. Tayaritja - Palawa name for OTL Flinders Island. Three Waters - OTL Launceston in Tasmania, a site of a formerly Kurnawal city that was conquered and annected by the Tjunini after the war in the latter half of the 11th century. Tiayal - Atjuntjan term for the lands along the southwestern coast of Australia, i.e. the coast where much of the empire's ancestral ethnicities came from. Dutch explorers named it D'Edels Land. In a more broader meaning, the term can also be used for the Atjuntjan Empire and homelands as a whole. Timber Haven - Nangu name for OTL Macquarie Harbour in Tasmania. Tjibarr - OTL Swan Hill, Tjibarr is Australia's oldest city and the first of the archaic Gunnagal city states that emerged from Australian prehistory. It has kept its important status even after the fall of the Watjubaga Empire, when it formed a powerful latter-day Gunnagalic kingdom. The name of the city means “the place of the gathering” in the language of the Gunnagal. Since medieval and early modern times, the city itself is often called “Tjibarr of the Lakes”, to differentiate it from the by-then territorially more expansive Kingdom of Tjibarr. Tjul Najima - “Island of Copper”, the Nangu name for Cider Island (OTL Tasmania). Treeless Desert - common term among natives in both southeast and southwest Australia for the OTL Nullarbor Plain (the name of which is actually derived from Latin, i.e. “null arbor = no trees/zero trees”). Truwana - Palawa term for OTL Cape Barren Island. Tuhonong - Junditmara city on the site of OTL Hamilton, Victoria; its proximity to the Junditmara ancestral lake Tae Rak (OTL Lake Condah) made it the most important spiritual centre of the Junditmara. Un Bennan - Atjuntjan name for OTL Mount Melville in Western Australia. Un Koit - Atjuntjan name for OTL Mount Clarence in Western Australia. Warneang - OTL town of Denmark in Western Australia, one of the three initial Atjuntja city states, later subjugated by the ruler of the White City. Watjubaga - “Dominion of the Five Rivers”, aka the Watjubaga Empire; a successor to Gulibaga, founded by conquest and unification of all Gunnagal territories by the Kingdom of Garrkimang and spanning most of southeast Australia at the height of its power during the first millenium AD. Weenaratta - Gunnagalic city, founded after the Collapse and during the Interregnum in between the surviving old city states of Tjibarr and Gundabingee. Wisdom Cities - collective name for the Gunnagalic city states on the banks of the Murray during the Archaic Gunnagal age. (The) White City / Witte Stad - see Milgawee. Wujal - Town founded by Nangu sailors and merchants and Kiyungu settlers in northeast Australia. Formerly just a trading outpost, resupply station and shipyard used for repairs by the Nangu, it eventually grew under the supervision of the famous Nangu sailor Werringi, aka Kumgatu the Bold, and the Nuttana trade company he helped create among the Nangu and several other Aururian nationalities. The town lies on the site of OTL Cooktown, Queensland. Wurrung Mountains - the OTL Otway Range. Yellow Pine - town on the site of OTL Strahan, Tasmania. Lies inside a large but shallow harbour that the Nangu call Timber Haven (OTL Macquarie Harbour). Yigutji - old Gunnagalic city, existing both in the Imperial and post-Imperial era of Gunnagal history, on the site of OTL Wagga Wagga. Yorta - one of the Mutjing city states on the Seven Sisters peninsula (OTL Eyre Peninsula), located on the site of the OTL town of Coffin Bay, South Australia. USEFUL BONUS: An additional geographic reference document created by Jared can be downloaded here. Aotearoa - the native name for OTL New Zealand is in scientific and everyday use in other parts of the world as well. Broch Strait - the OTL Bering Strait. Cavendia - formerly and English colony in North America, on what in OTL would be the the central eastern seaboard of the US. In the 18th century, Cavendia was, very approximately, the historical Province of Carolina (i.e., before the later division into North Carolina, South Carolina and Georgia). As happened historically, its borders had changed over time. Cavendia is one of the four major ATL countries on the eastern seaboard of North America. Dawson - Alleghenian city on the site of OTL Montgomery, Alabama. Formerly a Congxie settlement called “Unega”. Gustavsburg - North American town located on the site of OTL Bangor, Maine. Probably a former part of Nya Sverige from when it was still just a Swedish transatlantic colony. Horeb - ATL New England town located on the site of OTL Providence, Rhode Island. Chelmsford - ATL New England town located on the site of OTL Hartford, Connecticut. Named after the eponymous British town. Has a local newspaper called The Chelmsford Courant. Irving - ATL town belonging to the country of Alleghania, located on the site of OTL Columbus, Georgia. Kagana - Congxie/Alleghenian city on the site of OTL Tuscaloosa, Alabama. Kesteven - North American city located on the site of OTL Boston, Massachusetts. Maui - OTL Hawaiian Islands, named after a different main island than Hawaii as in OTL. New England - 20th century successor country to the former English colonies in what would be the OTL northeast US. The ATL New England is largely analogous to the eponymous OTL region in terms of territory. It was once a religiously puritanical nation, but has become one of the more secular North American countries in more recent history. It is one of the four major ATL countries on the eastern seaboard of North America. New London - the capital of Cavendia, on the site of OTL Charleston, South Carolina. Newport - ATL New England town located on the site of OTL New Haven, Connecticut. Nya Sverige - 20th century successor country to the former ATL Swedish colonies in OTL northern New England and southeast Atlantic Canada. One of the four major ATL countries on the eastern seaboard of North America. Oxford - North American city within the territory of Pembroke (OTL Maryland) in the ATL country of Cavendia. The city is located on the site of Cambridge, Maryland. Penguin Island - OTL Macquarie Island. Shrewsbury - North American city within the territory of Pembroke (OTL Maryland) in the ATL country of Cavendia. The city is located on the site of Cambridge, Maryland. Tejas - teritorially OTL early Texas, keeping the original Spanish form of its name. Tygeria - 20th century successor country to the former Dutch colonies in North America, aka New Netherland. The unusual-sounding name of the country is actually a reference to the famous Dutch colonial ship Tyger, captained by Adriaen Block during his 1613 voyage to explore the East Coast of North America and the present day Hudson River. Tygeria is one of the four major ATL countries on the eastern seaboard of North America. Westmoreland - North American city in the ATL country of Alleghania, on the site of OTL Williamsburg, Virginia.